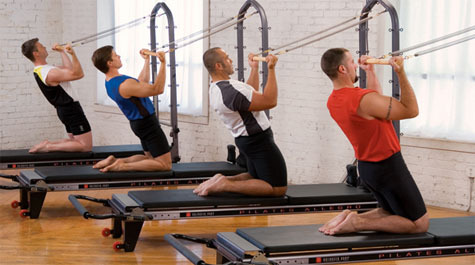 "Before starting Pilates, I experienced a variety of musculoskeletal problems for many years. These included recurrent neck pain (cervical osteoarthritis and muscle tension/spasm), upper back pain between my shoulder blades (chronic levator scapulae/rhomboid strain), recurrent low back pain an a prolonged episode of left leg/buttock pain that made walking difficult (degenerative disc at L5-S1 with compression of the S1 nerve root). I also had shoulder pain intermittently and recurrent pain/instability involving my right knee. These symptoms have disappeared due primarily to Pilates. I have learned to realign my muscles and use them properly. My posture has improved as has breathing and core strength. Correct head and neck position is especially important for me. Of course, the changes due to osteoarthritis in my cervical and lumbar areas that can be seen on x-rays are still present but the symptoms are gone due to Pilates reeducation." "I've been teaching yoga for several years, and after taking Pilates, I feel an even deeper connection to my body. With the help of the Allegro Reformer, I've improved my alignment in yoga poses, and this helps me be a better teacher. Pilates is a great complement to my yoga practice, and I highly recommend it." "Pilates helps dancers with proper alignment, injury-prevention and rehabilitation while creating a greater ease of movement for a seamless performance." "I started Pilates because I missed dancing and I missed my dance-shaped body! I had no true injuries, but I was out of shape, having had my first child not too long before. Things in my body were just not right. I was having trouble with my inner thighs, as they were pulled in the delivery of my sweet baby I have scoliosis and would get painful muscle spasms. I looked Pilates up in the phone book. I began practicing and have been enjoying it for almost 7 years now. Pilates has returned my body to more closely resemble my "dancer body" with length and strength. more » "It's extremely rare that I get a muscle spasm now. I've made it through 2 more pregnancies and births beautifully. Pilates helps me get my pelvis and abdomen back to a stable and properly functioning area after babies. The breath also helped me so much in labor and delivery (who knew!) I practice now, as I did in the beginning, because I love the marriage of science and movement that I find in Pilates, specifically Polestar Pilates. It is actually enjoyable instead of feeling like a chore. I get to move and release my body and breath to work in a rhythm that inspires both relaxation and power in me." "Our players need long, strong, balanced muscles with an emphasis on the core of the body. That's why we use Pilates training and specifically the Allegro Reformer in the Raider's weight room. We are looking for every edge to win and the Allegro gives us that edge. The Allegro is versatile and built tough enough to handle an NFL team." "Pilates workouts using Balanced Body reformers are an excellent conditioning tool for the NBA. The strength, agility, and performance of my players have increased and Pilates has become such an essential part of our workouts that we take a reformer to our away games. I even have a Studio Reformer for my own home use." Pilates for golfers can help players gain distance and accuracy while conditioning the body for play. Pilates Performance & Rehab's programs are specifically geared for keeping golfers healthy, pain free, and in the game. "I've hit my longest drive since starting Pilates." "I am a golfer with chronic back problems. Pilates helps to increase my flexibility and continue playing." "Since starting Pilates, I now can impress my husband and his friends with my improved golfing skills." "I do love Pilates. I am a 65 year old accountant who loves golf. "I started Pilates at the encouragement of my wife. I had foot problems that were causing pain and had reduced my ability to do anything active. With the pain, I gladly accepted my wife's suggestion to come see you. After just a short amount of time, I knew that you could help and I began sharing time with my wife. You set out a program to relieve my pain and then began a program to straighten me up and correct my posture and help improve my golf swing. My swing has greatly improved and is much more relaxed. more » "I am continuing Pilates to make sure that I reach maximum flexibility. When one sits behind a desk working at a computer, they need to have improved posture or they'll begin to fold over and look older before their time. I try to sell your program to everyone. It is great and I feel that it has improved my health."